In Uriel Ben Mordechai’s new translation of Romans (principally from the earliest extant version we have, Papyrus 46 – circa 170 CE), we see the use of the Hebraic understanding of our nature consisting of two ‘hearts’, that is, of a fleshly heart and a spiritual heart; an evil inclination (the Yetzer haRa), and a good inclination, (the Yester HaTov). For much more on this and other Hebraic principles or Hebraisms, please see my articles on the Hebraic Mindset as circumcisedheart.info as well as my book ‘Doctrinal Pitfalls of Hellenism’. Uriel essentially translates the Greek back into its Hebraic underpinning and perspective, and then into English (à la, Prof. David Flusser) so that the Yetzer haRa and Yetzer haTov are seen and explicitly referred to in Romans 2:17; 7:5; 8:4, 5, 6, 11,12,13, and in 8:26. Judaism understands from the Tanakh that man has two hearts, and two inclinations, an inclination to do good and an inclination to do bad. This Hebraic concept of ‘Yetzer HaRa’ and ‘Yetzer HaTov’ (the evil inclination and the good inclination) relates to the choice of the will to be faithful to God rather than follow the natural ‘lusts of the flesh’. The origin of this understanding is that in Hebrew the singular for ‘heart’ (pronounced ‘lev’) is לב and the plural ‘hearts’ is sometimes spelt in more than one way such as לבבך or ֵלבבם or לבבות. If you look at the Sh’ma (starting at Deut 6:4) in a Hebrew Bible such as Hebrew-English Tanakh (Varda Books 2009) you will see the plural, לבבך in both verses 6 and 7. So some debate occurred within Israel religious scholars over the centuries about why the plural? The Talmud relates that their conclusion is that we have two hearts, a yetzer hatov and a yetzer hara (essentially a ‘fleshly heart’ and a ‘spiritual heart’). This is also clearly seen in the ‘Al Chet’ Prayer that is recited every Yom Kippur, where the 19th prayer is to pray for forgiveness “For the mistakes we committed before You with the Yetzer HaRa”. Thus all who seek HaShem need to make the choice to follow the good heart rather than the fleshly heart. All who have ‘circumcised hearts’ are then aligning their ‘fleshly heart’ with their ‘spiritual heart’, and will inherit the Olam HaBah, the Kingdom of God. 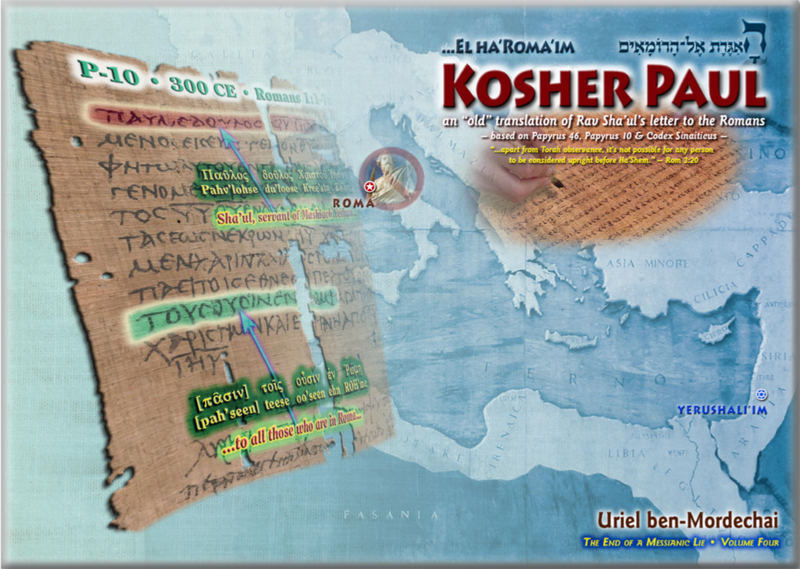 The Apostle Paul calls the Torah spiritual in a number of places such as 1 Cor 10:3 and Romans 7:14. So for example, when Paul writes in 1 Cor 15:44 “It is sown a natural body; it is raised a spiritual body. If there is a natural body, there is also a spiritual body.” he is speaking primarily on an individual basis of this choice that we all have – whether to be ‘born from above’, that is to follow our good inclination, to circumcise our hearts and have the ‘faith of Yeshua’ which is the ‘faith/faithfulness of Abraham’, or to remain alienated from God in allowing our ‘fleshly heart’ or evil inclination to lead us astray. Mussar (Jewish ethics – see this short post for an introduction) teaches though that the ‘evil inclination’ is really also for our good because when recognized and alerted to, it can help us to recognize where our character falls short and what we need to correct to synchronize our ‘fleshly heart’ with our ‘spiritual heart’ so as to fully turn our whole being to HaShem. 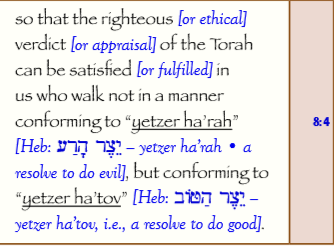 “…so that the righteous verdict of the Torah can be satisfied in us who walk not in a manner conforming to “yetzer ha’rah,” but conforming to “yetzer ha’tov”. … A significant part of Flusser’s approach as a linguist fluent in over 9 languages including Greek and Hebrew, was to translate the Greek versions of Luke, for example, back into Hebrew. When he did this, he was able to show how good a fit such ‘reverse-translations’ were, as well as highlight small but significant portions where this does not work.